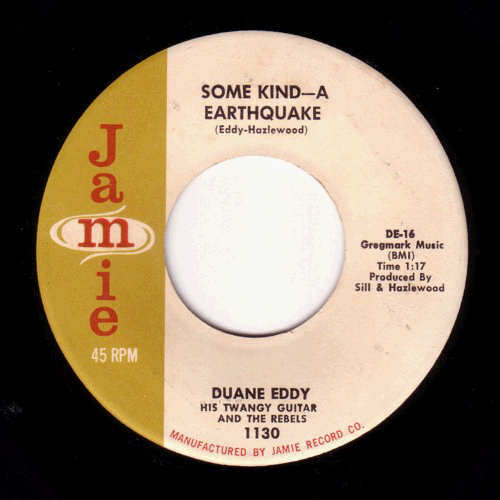 Some Kind-A Earthquake has an interesting history. Released in October 1959, and peaking at #37, and is still the shortest top 40 single ever! The original length of 1:17, which was an ideal situation for the U.S. top 40 radio stations play list formats, especially if it's an instrumental. However, when it was released in the U.K. the length was extended to 2:01 (re-edited from the original). The contrary view being that the length was too short for U.K. radio. Then in 1994, Bear Family Records issued their "Twangin' From Phoenix To L.A." box set. A so called first master version emerged with an alternate saxophone arrangement which is around 1:40 in length. That would have probably been a happy medium for the U.S. and the U.K.